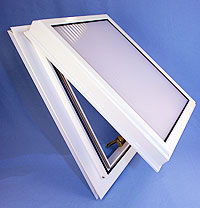 We offer a competitively priced upvc/aluminium roof vent and also an all aluminium vent. They are available either as a maunal opening or elcetrical opening with a climate control option. They can be glazed with polycarbonate or glass (25mm and over). please provide: width, depth, colour choices (if non standard). (The vent should be ordered at the same width as the glazing panel above and below it). We can send you information on calculating the glass sizes. If you require a vent powder coated to a specific RAL colour please contact us for a custom quote. The upvc/aluminium Conservatory Roof Vents are guaranteed for 10 years. As well as Conservatory Roof Vents Omega Build supply a range of roofing components such as roof lanterns, roof domes, diy conservatory roof kits, polycarbonate roofing sheets, polycarbonate canopy kits, door canopy kits and much more. I would recommend your affordable products (Conservatory Roof Vents | Omega Build) to anyone else considering this product, as it has been superb. Omega Build Shop | Conservatory Roof Vents | Omega Build. You are viewing Conservatory Roof Vents | Omega Build, buy online today!